, a learned and illustrious English architect and mathematician, was nephew to bishop Wren, and the son of Dr. Christopher Wren, who was fellow of St. John’s college, Oxford, afterwards chaplain to Charles I. and rector of Knoyle in Wiltshire; made dean of Windsor in 1635, and presented to the rectory of Hasely in Oxfordshire in 1638; and died at Blechindon, in the same county, 1658, at the house of Mr. William Holder, rector of that parish, who had married his daughter. 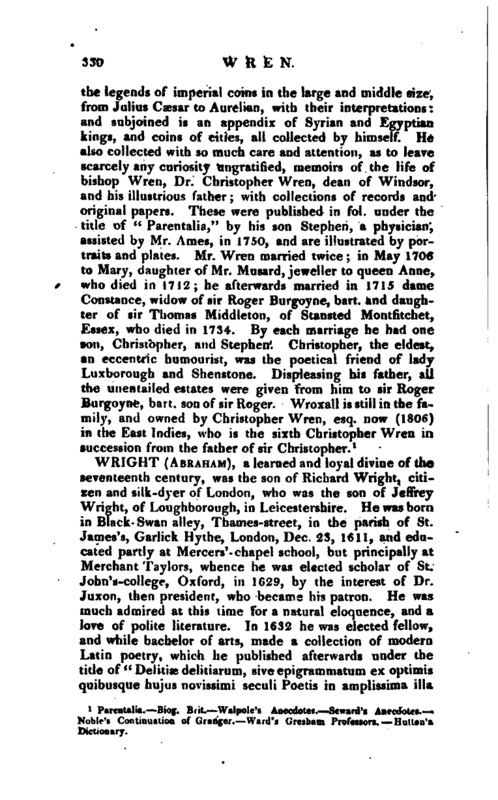 He was a man well skilled in all the branches of the mathematics, and had a great hand in forming the genius of his only son Christopher.‘ In the state papers of Edward, earl of Clarendon, vol.1, p. 270, is an estimate of a building to be erected for her majesty by dean Wren. He did another important service to his country. After the chapel of St. George and the treasury belonging to it had been plundered by the republicans, he sedulously exerted himself in recovering as many of the records as could be procured, and was so successful as to redeem the three registers distinguished by the names of the Black, Blue, and lied, which were carefully preserved by him till his death. | They were afterwards committed to the custody of his son, who, soon after the restoration, delivered them to Dr. Bruno Ryves, dean of Windsor. His son Christopher, who is the subject of this article, was born at Knoyle Oct. 20, 1632 and, while very young, discovered a surprising turn for learning, especially for the mathematics. He was sent to Oxford, and admitted a gentleman-commoner at Wadham college, at about fourteen years of age: and the advancements he made there in mathematical knowledge, before he was sixteen, were, as we learn from Oughtred, very extraordinary, and even astonishing. 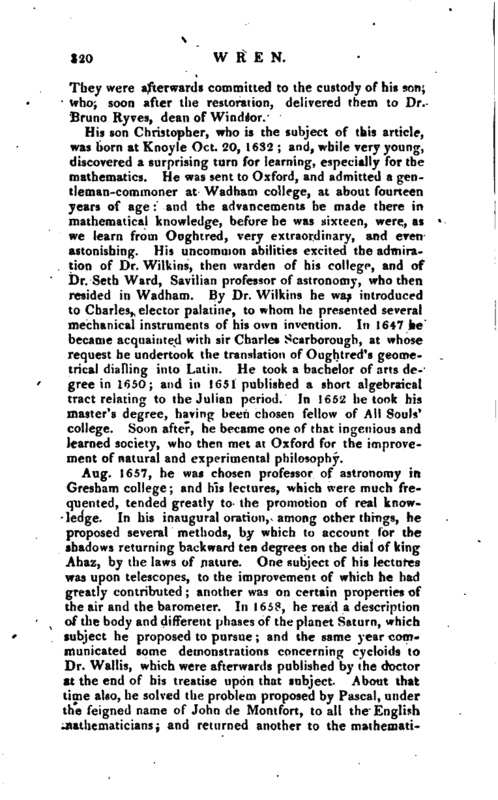 His uncommon abilities excited the admiration of Dr. Wilkins, then warden of his college, and of Dr. Seth Ward, Savilian professor of astronomy, who then resided in Wadham. By Dr. Wilkins he was introduced to Charles, elector palatine, to whom he presented several mechanical instruments of his- own invention. In 16*7 he became acquainted with sir Charle* Scarborough, at whose request he undertook the translation of Oughtred’s geometrical dialling into Latin. He took a bachelor of arts degree in 1650; and in 1651 published a short algebraical tract relating to the Julian period. In 1652 betook his master’s degree, having been chosen fellow of All Souls’ college. Soon after, he became*one of that ingenious and learned society, who then met at Oxford for the improvement of natural and experimental philosophy. Aug; 1657, he waschosen professor of astronomy in Gresham college; and his lectures, which were much frequented, tended greatly to the promotion of real knowledge. In his inaugural oration, among other things, he proposed several methods, by which to account for the shadows returning backward ten degrees on the dial of king Ahaz, by the laws of nature. One subject of his lectures was upon telescopes, to the improvement of which he had greatly contributed; another was on certain properties of the.air and the barometer. In 1658, he read a description of the body and different phases of the planet Saturn, which subject he proposed to pursue; and the same year communicated some demonstrations concerning cycloids to Dr. Wallis, which were afterwards published by the doctor at the end of his treatise upon that subject. About that time also, he solved the problem proposed by Pascal, under the feigned name of John de Montfort, to all the English mathematicians; and returned another to the | mathematicians in France, formerly proposed by Kepler, and then solved likewise by himself, of which they never gave any solution. He did not continue long at Gresham college; for, Feb. 5, 1660-1, he was chosen Savilian professor of astronomy at Oxford, in the room of Dr. Seth Ward. He entered upon it in May; and in September was created doctor of civil law. Among his other eminent accomplishments, he had gained so considerable a skill in architecture, that he was sent for the same year from Oxford, by order of Charles II. 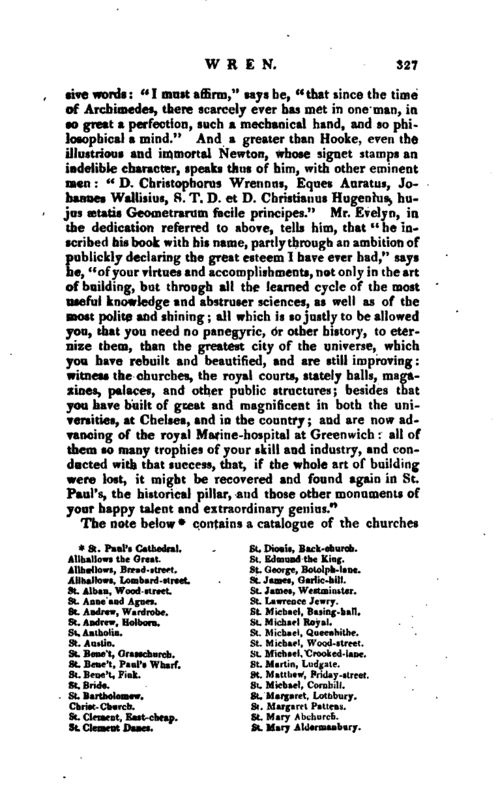 to assist sir John Denham, surveyor-general of his majesty’s works. In 1663, he was chosen ’fellow of the Royal Society; being one of those who were first appointed by the council after the grant of their charter. 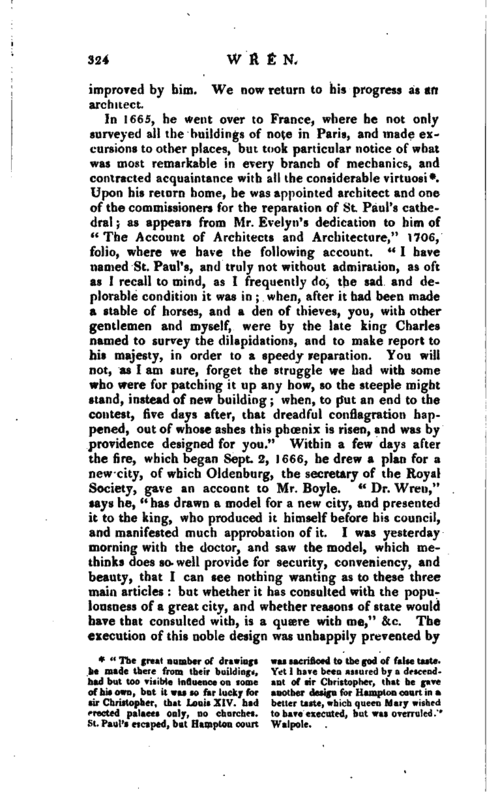 Not long after, it being expected that the king would make the society a visit, the lord Brounker, president, by a letter desired the advice of Dr. Wren, who was then at Oxford, concerning the experiments which might be most proper for his majesty’s entertainment: to whom the doctor recommended principally the Torricellian experiment, and the weatherneedle, as being not bare amusements, but useful, and likewise neat in the operation, and attended with little incumbrance. 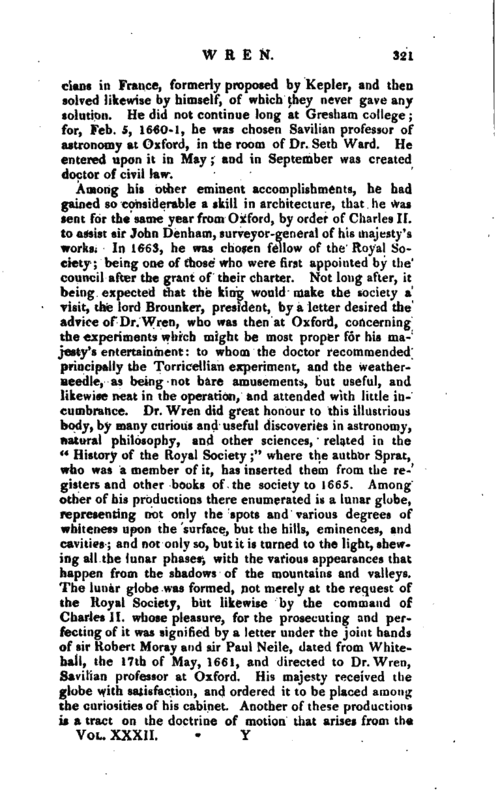 Dr. Wren did great honour to this illustrious body, by many curious and useful discoveries in astronomy, natural philosophy, and other sciences, related in the “History of the Royal Society” where the author Sprat, who was a member of it, has inserted them from the registers and other books of the society to 1665. Among other of his productions there enumerated is a lunar globe, representing not only the spots and various degrees of whiteness upon the surface, but the hills, eminences, and cavities; and not only so, but it is turned to the light, shewing all the lunar phases, with the various appearances that happen from the shadows of the mountains and valleys; The lunar globe was formed, not merely at the request of the Royal Society, but likewise by the command of Charles II. whose pleasure, for the prosecuting and perfecting of it was signified by a letter under the joint hands of sir Robert Moray and sir Paul Neile, dated from Whitehall, the 17th of May, 1661, and directed to Dr. Wren, Savilian professor at Oxford. His majesty received the globe with satisfaction, and ordered it to be placed among the curiosities of his cabinet. Another of these productions is a tract on the doctrine of motion that arises from the | impact between two bodies, illustrated by experiments. And a third is, the history of the seasons, as to the temperature, weather, productions, diseases, &c. &c. For which purpose he contrived many curious machines, several of which kept their own registers, tracing out the lines of variations, so that a person might know what changes the weather had undergone in his absence: as wind-gages, thermometers, barometers, hygrometers, rain- gages, &c. &c. He made also great additions to the new discoveries on pendulums; and among other things shewed, that there may be produced a natural standard for measure from the pendulum for common use. He invented many ways to make astronomical observations more easy and accurate, He fitted and hung quadrants, sextants, and radii more commodiously than formerly: he made two telescopes to open with a joint like a sector, by which observers may infallibly take a distance to half minutes, &c. He made many sorts of retes, screws, and other devices, for improving telescopes to take small distances, and apparent diameters, to seconds. He made apertures for taking in more or less light, as the observer pleases, by opening and shutting, the better to fit glasses for crepusculine observations. He added much to the theory of dioptrics; much to the manufacture of grinding good glasses. He attempted, and not without success, the making of glasses of other forms than spherical. He exactly measured and delineated the spheres of the hamoura of the eye, the proportions of which to one another were only guessed at before: a discussion shewing the reasons why we see objects erect, and that reflection conduces as much to vision as refraction. He displayed a natural and easy theory of refractions, which exactly answered every experiment. 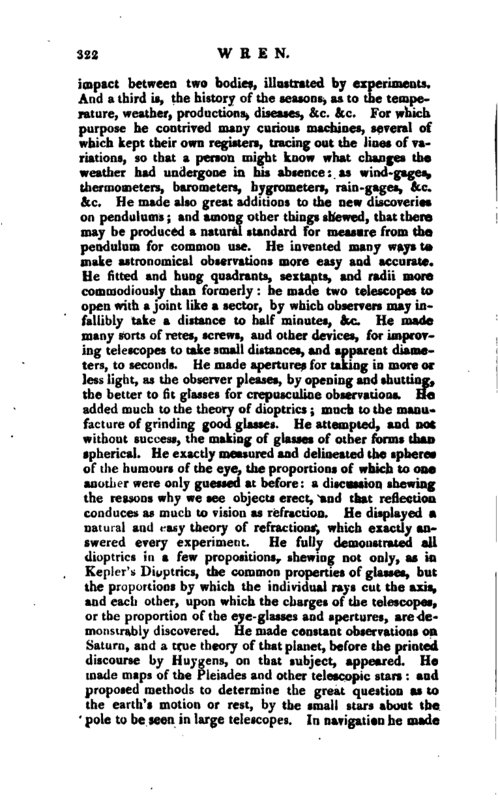 He fully demonstrated all dioptrics in a few propositions, shewing not only, as in Kepler’s Dioptrics, the common properties of glasses, but the proportions by which the individual rays cut the axis, and each other, upon which the charges of the telescopes, or the proportion of the eye-glasses and apertures, are demonstrably discovered. He made constant observations on Saturn, and a true theory of that planet, before the printed discourse by Huygens, on that subject, appeared. He made maps of the Pleiades and other telescopic stars: and proposed methods to determine the great question as to the earth’s motion or rest, by the small stars about the pole to be seen in large telescopes. In navigation he made | many improvements. He framed a magnetical terella, which he placed in the midst of a plane board with a hole, into which the terella is half immersed, till it be like a globe with the poles in the horizon the plane is then dusted over with steel filings from a sieve the dust, by the magnetical virtue, becomes immediately figured intofurrows that. bend like a sort of helix, proceeding as it were out at one pole, and returning in it by the other; the whole plane becoming figured like the circles of a planisphere. It being a question in his time among the problems of navigation, to what mechanical powers sailing against the wind was reducible; he shewed it to be a wedge: and he demonstrated, how a transient force upon an oblique plane would cause the motion of the plane against the first mover: and he made an instrument mechanically producing the same effect, and shewed the reason of sailing on all winds. 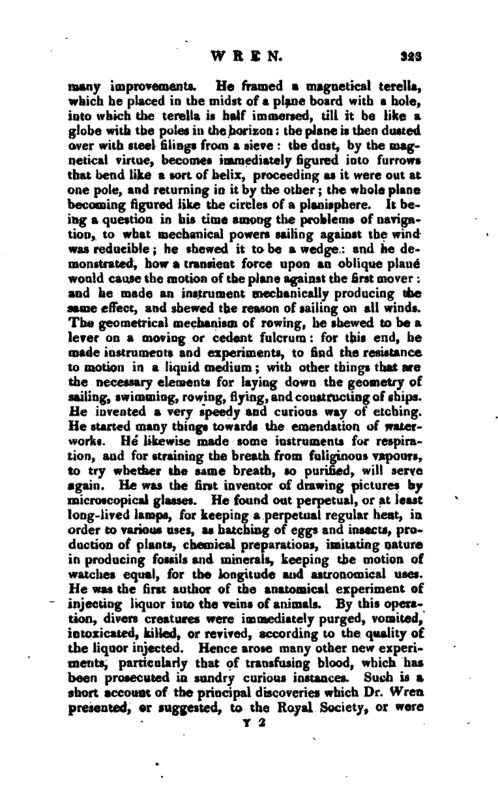 The geometrical mechanism of rowing, he shewed to be a lever on a moving or cedent fulcrum: for this end, he made instruments and experiments, to find the resistance to motion in a liquid medium; with other things that are the necessary elements for laying down the geometry of sailing, swimming, rowing, flying, and constructing of ships. He invented a very speedy and curious way of etching. He started many things towards the emendation of waterworks. He likewise made some instruments for respiration, and for straining the breath from fuliginous vapours, to try whether the same breath, so purified, will serve again. He was the first inventor of drawing pictures by microscopical glasses. He found out perpetual, or at least long-lived lamps, for keeping a perpetual regular heat, in order to various uses, as hatching of eggs and insects, production of plants, chemical preparations, imitating nature in producing fossils anji minerals, keeping the motion of watches equal, for the longitude and astronomical uses. He was the first author of the anatomical experiment of injecting liquor into the veins of animals. By this operation, divers creatures were immediately purged, vomited, intoxicated, killed, or revived, according to the quality of the liquor injected. Hence arose many other new experiments, particularly that of transfusing blood, which has been prosecuted in sundry curious instances. Such is a short account of the principal discoveries which Dr. Wren presented, or suggested, to the Royal Society, or were | improved by him. We now return to his progress as an architect. erected palaces only, no churches, to have executed, but was overruled." St. Paul’s escaped, but Hampton court Walpole. 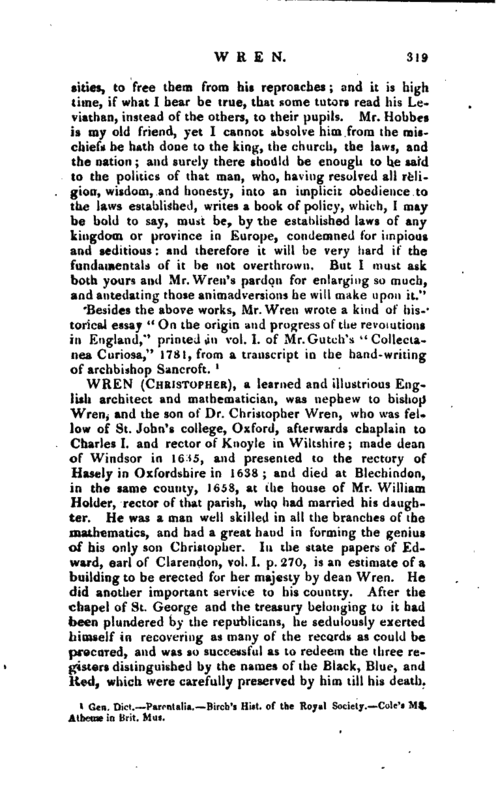 | the disputes which arose about private property, and the haste and hurry of rebuilding; though it is said that the practicability of Wren’s whole plan, without infringement of any property, was at that time demonstrated, and all material objections fully weighed and answered. Upon the decease of sir John Denham, in March 1688, he succeeded him in the office of surveyor-general of his majesty’s works. The theatre at Oxford will be a lasting monument of his great abilities as an architect; which curious work was finished by him in 1669. As in this structure the admirable contrivance of the flat roof, being eighty feet over one way, and seventy the other, without any arched work or pillars to support it, is particularly remarkable, it has been both largely described, and likewise delineated, by the ingenious Dr. Plott, in his “Natural History of Oxfordshire.” But the conflagration of the city of London gave him many opportunities afterwards of employing his genius in that way; when, besides the works of the crown, which continued under his care, the cathedral of St. Paul, the parochial churches, and other public structures, which had been destroyed by that dreadful calamity, were rebuilt from his designs, and under his direction; in the management of which affair he was assisted in the measurements and laying out of private property by the ingenious Mr. Robert Hooke. The variety of business in which he was by this means engaged requiring his constant attendance and concern, he resigned his Savilian professorship at Oxford in 1673; and the year following he, received from the king the honour of knighthood. 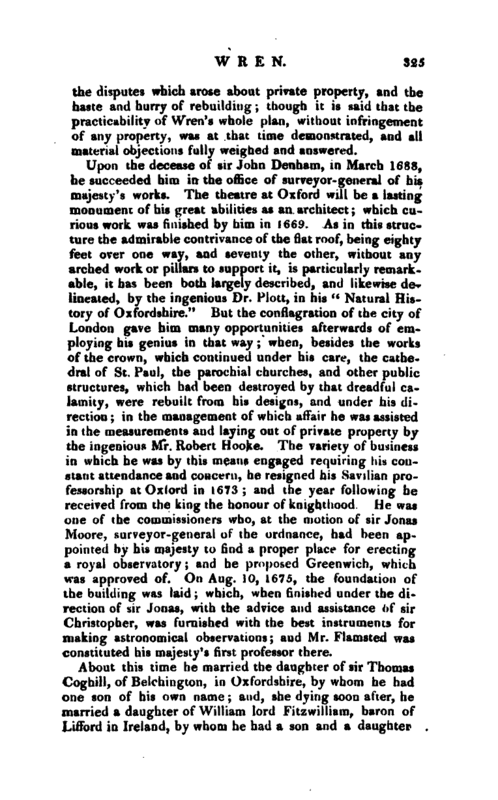 He was one of the commissioners who, at the motion of sir Jonas Moore, surveyor-general of the ordnance, had been appointed by his majesty to find a proper place for erecting a royal observatory; and he proposed Greenwich, which was approved of. On Aug. 10, 1675, the foundation of the building was laid; which, when finished under the direction of sir Jonas, with the advice and assistance of sir Christopher, was furnished with the best instruments for making astronomical observations; aud Mr. Flamsted was constituted his majesty’s first professor there. Non sibi, sed bono publico. * St. Paul’s Cathedral. St. Dioois, Back-church. Allhallows the Great. St. Edmund the King. Allhallows, Bread-street. St. George, Botolph-lane. Allhallows, Lombard-street. St. James, Garlic-hill. St. Alban, Wood-street. St. James, Westminster. St. Anne and Agnes. St. Lawrence Jewry. St. Andrew, Wardrobe, St. Michael, Basing-hall. St. Andrew, Holborn. St. Michael Royal. St. Anthoiin. St. Michael, Queenhithe. St. Austin. St. Michael, Wood-street. St. Bene’t, Grasschnrcb. St. Michael, Crooked-lane. St. Bene’t, Paul’s Wharf. St. Martin, Ludgate. St. Bride. St. Michael, Cornhill. St. Bartholomew. St. Margaret, Lothbury. St. Clement, East-cheap. St. Mary Abchurch. St. Clemeut Danes. St. Mary Aldermanbury. | of the city of London, royal palaces, hospitals, and public edifices, built by sir Christopher Wren, siirveyor-general of the royal works during fifty years, viz. from 1668 to 1718. St. Mary Magdalen. St. Dunstan in the East. St. Mary SoriMset. St. Mary Aldertnary. St. Mary at Hill. St. Sepulchre’s. St.N.cholas Cole Abbey. The Monument. St. Olave Jewry. Custom- House, London. St, Stephen, Colman- street. Greenwich-Hospital. St. Mildred, Bread-street. Theatre at Oxford. St. M.Ufrtd, Poultry, &c. &c.
Westminster Abbey, repaired. | cannot wonder left such an impression of content on the mind of the good old man, that, being carried to see it once a year, it seemed to recall a memory that was almost deadened to every other use.“The same writer observes, that” so many great architects as were employed on St. Peter’s (at Rome) have not left it,* upon the whole, a more perfect edifice than this work of a single mind." 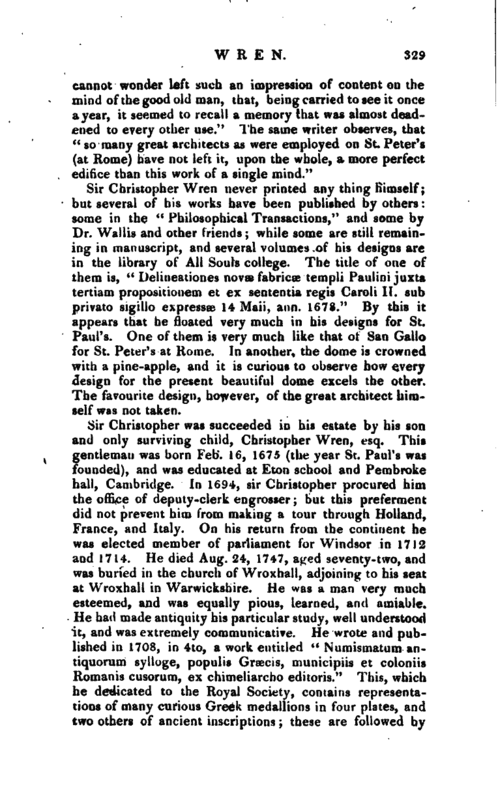 Sir Christopher Wren never printed any thing himself; but several of his works have been published by others: some in the “Philosophical Transactions,” and some by Dr. Wallis and other friends; while some are still remaining in manuscript, and several volumes of his designs are in the library of All Souls college. The title of one of them is, “Delineationes novae fabricae templi Paulinijuxta tertiam propositionem et ex sententia regis Caroli II. sub private sigillo expresses 14 Maii, ann. 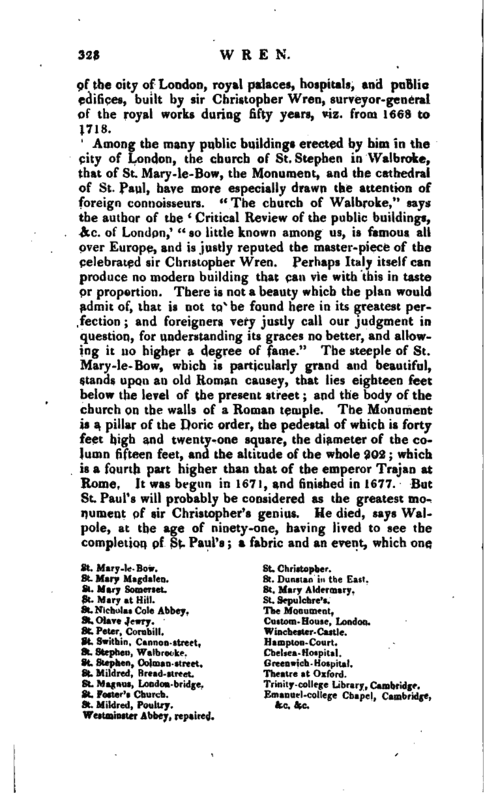 1678.” By this it appears that he floated very much in his designs for St. Paul’s. One of them is very much like that of San Gallo for St. Peter’s at Rome. In another, the dome is crowned with a pine-apple, and it is curious to observe how every design for the present beautiful dome excels the other. The favourite design, however, of the great architect himself was not taken. 1 Parentalia.Biog. Brit. 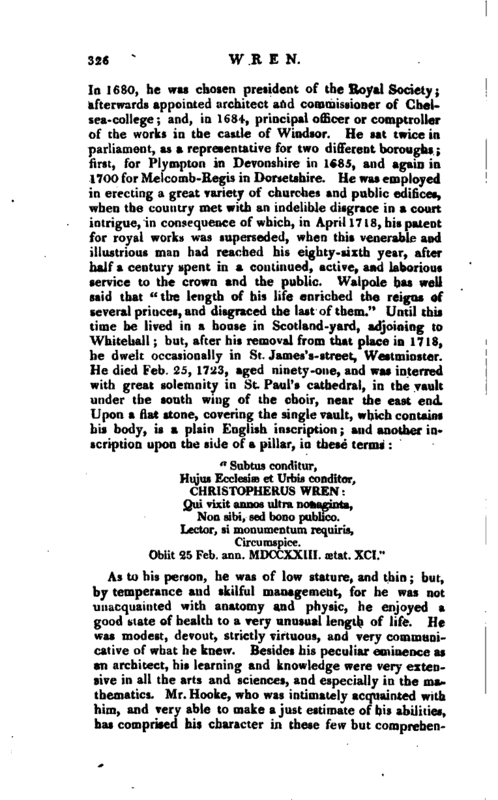 Walpole’s Anecdotes.Seward’s Anecdotes. Noble’s Continuation of Grader. Ward’s Gresharn^ Professors. —Hutton’s Dictionary.